The Indian unit of Intel is freezing hiring this year as it consolidates its R&D operations in Bangalore . The freeze is also in line with Intel's worldwide target of ending 2014 with 5 per cent fewer employees . "We are not hiring any people this year and in the near future ... we are deploying resources in new areas like mobile, tablets, allin-ones ," Intel India president Kumud Srinivasan told media in Bangalore on Wednesday. Intel, the world's largest chip maker for personal computers, announced it would end the current year with fewer staff after the company reported December quarter earnings that missed street expectations owing to falling PC sales in its main markets, including the United States. The reduction in staff worldwide is likely to come in the form of retirements, voluntary programmes and through attrition, Intel said on January 17. Intel ended 2013 with some 108,000 employees. Intel India currently has about 4,500 staff, with about a third of them added over the last two years, Srinivasan said. Globally, Intel has an attrition or staff churn rate of 4 per cent, Srinivasan said. While Intel does not give India-specific numbers, attrition in India is in the "very low single digits," an Intel spokesman said. Srinivasan also said the company was investing $120 million in consolidating its centres in India at its facility in Bangalore. 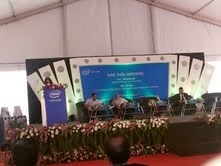 Intel had invested some $2 billion in its Indian operations since it started here in 1988, she said. India is Intel's largest non-manufacturing site outside the US, the company said in a statement on Wednesday. The consolidated facility in Bangalore will be a global centre of excellence for chip design, according to the statement.